See a list of analysts that cover Walmart. 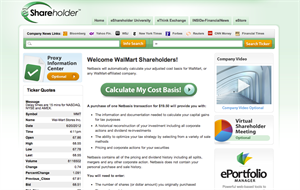 For historical cost basis information, you may use NetBasis to calculate the cost basis for your Walmart common stock, adjusted for any corporate actions or dividend reinvestments. For help, email NetBasis at customerservice@networthservices.com or call 1-888-80-BASIS (1-888-802-2747). When you select Visit NetBasis below, you will leave Walmart's website and be redirected to the NetBasis system, which contains certain historical information about the Walmart stock. Walmart has no control over, receives no compensation from, and neither endorses nor recommends, NetBasis versus other similar tax calculators. Walmart makes no representation or warranty as to the accuracy of any cost basis calculation made using NetBasis or the information on the NetBasis website. Walmart urges you to consult your tax adviser about your tax basis in your Walmart stock. Walmart shall have no liability for any injury or damages you incur as a result of your use of NetBasis.